AB grew up in an abusive home. Soon they resorted to sleeping at friends’ places and sleeping outside. 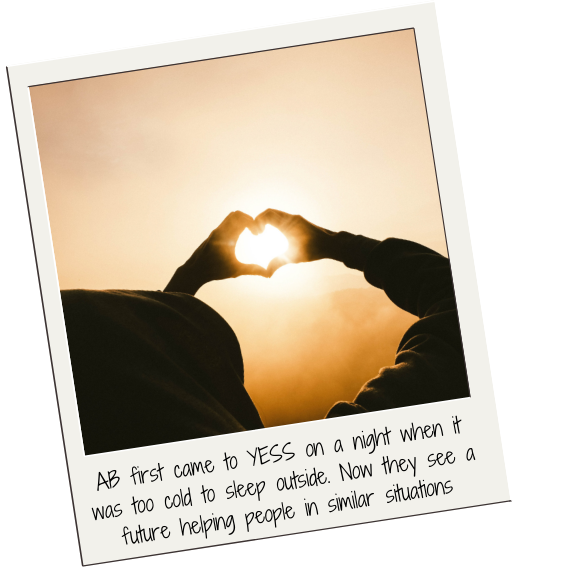 The first time they came to YESS was on a night when it was too cold to sleep outside. YESS staff helped AB find housing and AB is now living in a group home environment where they can learn the basics about living on their own. AB’s most defining experience at YESS was feeling supported to not just feel safe, but also move forward. With their basic needs met in a safe place with good people who care, AB felt empowered to set goals and make plans to accomplish them. AB sees a future in helping people who have been in the same situations AB has experienced. Like many other YESS youth, AB feels they could help others experiencing homelessness because they understand how those people feel. If AB could give someone experiencing homelessness advice now, what would they say? AB has been so strong and committed to their goals. What would they say is their greatest accomplishment? We are so proud of AB and all the hard work they’ve put towards their goals and their healing. It is truly inspiring to see AB apply what they’ve learned about self-love and use that as their momentum to move forward.